Provides students with an exposition of Roman civil law and procedure, setting the law in the context of the history of Rome and keeping the use of Latin phrases to a minimum. A major feature of the book is the use of texts from Roman legal and literary sources. Within the space of a thousand years, Roman society transformed itself from an insignificant tribe on the Italian mainland struggling for territorial supremacy, to one of the most accomplished civilisations of the ancient world, whose Empire extended over the greater part of Western Europe, the Mediterranean and northern Africa. This transformation was not a chance event. It was a direct result of the Roman genius for government and the law. Through a relentless campaign of "empire building", Roman armies conquered and subjugated vast territories. Unlike other conquerors of the ancient world, however, the Romans were keenly aware that their dominance of these regions could only be maintained through a process of "Romanization" that included the installation of an effective bureaucracy utilising a flexible system of law. Although the Roman Empire was destined to disintegrate over time, its legal system left an indelible imprint on Western Europe. 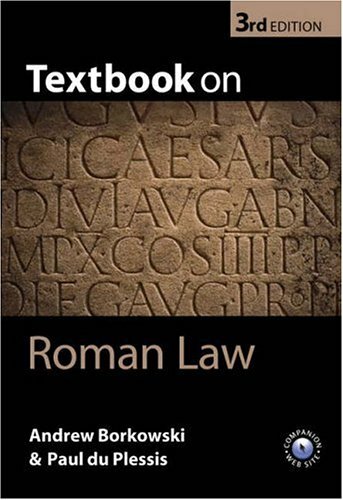 Roman law, as rediscovered by the Italian Glossators in the eleventh century, provided the conceptual foundation of many modern legal systems, and continues to provide an invaluable introduction to paradigms of legal thought and the study of legal concepts. Above all, Roman law is richly rewarding to study for its own sake, as a remarkable feat of organized good sense and structured orderliness. The book provides students with a lucid and readable exposition of Roman civil law and procedure. To make the subject more accessible, the author sets the law in the context of the history of Rome and keeps the use of Latin phrases to a minimum. A major feature of the book is the use of texts (in translation) from the most important sources of Roman law. The texts serve to illustrate the law and to make it more vivid for the reader. This third edition has been fully updated to reflect recent developments in Romanist scholarship. References to key articles and books have been incorporated into the text and further reading sections included at the end of each chapter. The final chapter on Roman law and the European ius commune has been substantially expanded. Online Resource Centre * Glossary of Latin terms appearing in the text. * Annotated web links to search engines and websites devoted to Roman law. * Comprehensive time line incorporating Roman legal and social history. * Short biographies of key figures in Roman legal history. * Original Latin versions of citations reproduced in the book * Multiple choice questions covering each chapter.